Melton RFC’s difficult season continued when a patched-up XV were well-beaten at Old Northamptonians on Saturday. The First XV travelled to Northampton with several players unavailable or injured, but all of the replacements played out of their skins and turned in a display which will give the whole club cause for optimism for the rest of the season. Jordan Pawley and Mark Cavanah made first team starts, along with young scrum-half Archie Hutchinson, and all were a credit to themselves and the club. If they were selected to play again next weekend, they would thoroughly deserve the opportunity. Hutchinson and Chris Rose were outstanding in their new half-back partnership considering the pace of the game and having most of the ball on the back foot. Once their intuitive instincts kick in, this partnership could be the turning point of the season. Melton captain Leon Gormley was again in superb form, making hard yards from the unfamiliar centre position while producing more than 15 cover tackles to snuff out the home side’s pacey backs. Sam Dennison also had to play most of the match in the centre and will thrive on the experience. Melton started brightly, but the longer the half progressed the more ball the hosts gained, usually from indecisive play or wrong decisions such as running the ball out of the 22 when putting the ball out or away with a good chase would have been more sensible. But the errors were indicative of a team thrown together in a league as tough as Midlands One East. Turning around 24 points down, Melton could have thrown in the towel, but again to their credit they manned up and tackled ferociously. They kept the home side at bay for long periods only for a stray pass to give the opposition an easy score. Adam Woolley always tackles above his weight, while Dave Meakin added his considerable presence to the pack, and both were excellent going forward and in defence, while Dan Evans and Luke Pawley worked tirelessly. 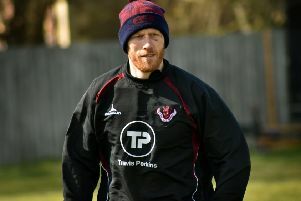 Head coach Gareth Collins will have a huge selection dilemma on Saturday, but he must take into account the enthusiasm and commitment these players showed. The home side added 28 points in the second half in a 52-0 win, but were often persuaded to kick penalties rather than take Melton on up front. The result did not reflect the effort, and all of the players need to regroup for Saturday’s home meeting with Oundle RFC at Burton Road (kick-off 2.15pm).